We take a break from the barricade for a brief interlude at dawn: Cosette wakens, unaware of what’s happening in the rest of the city, and wonders why people are slamming doors so early in the morning. Like Marius, she knows she cannot live without him. Unlike Marius, she takes that to be proof that he’ll arrive soon. When a well-equipped army faces a street barricade, they’ll often just keep up steady fire, hoping to trick the insurgents into using up their ammunition and then launch an assault when they run out. Enjolras is too smart to fall for it. The scale of the forces available really points up the silliness of musical-Javert’s fake intelligence report: when they can fill the street with soldiers, why would they choose to “concentrate their force” on one side? Bossuet admires Enjolras’ ability to be brave without a mistress to rob him of his wits like the rest of them. Enjolras is basically asexual, his whole being focused on social change, but in a sense, he does have a mistress: Patria, he whispers: the homeland. When the army brings up a second cannon, things start getting serious. They repel the attack just barely, but it takes most of their ammunition. Let me just say: Watching or reading Les Misérables is really different before and after you have kids. Interlude: Gavroche’s anonymous brothers, roughly five and seven, are still alive, still on the streets, though they’ve somehow managed to get into the Luxembourg Gardens. I wasn’t expecting to see them again. A middle-class gentleman is there, with his son, who has decided not to finish his cake. The father advises him to throw it to the ducks — not to the two ragamuffins who clearly need it more than the ducks do. “We must always be kind to animals.” But apparently, not to one’s fellow man. The boy reluctantly tosses it, and they leave, but the older boy retrieves it, offering the larger part to his brother. The implication is that they’ll be okay…or at least as okay as any Paris urchin is. 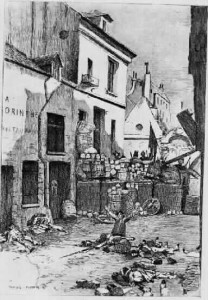 Back at the barricade, Marius retrieves Gavroche’s body, seeing an echo of their fathers’ encounter at Waterloo — only Col. Pontmercy had still been alive. Gavroche is laid on the table with M. Mabeuf: the oldest and youngest of the defenders. Hugo briefly discusses the sense of unreality that pervades both the experience and memory of street warfare. At midday, Enjolras decides it’s time to reinforce the tavern with paving-stones, forming a fortress with the tavern as keep and the barricade as its outer wall. He also finally allows them to bring out the wine bottles that he confiscated at the beginning of the whole thing. The wounded are locked into the kitchen. By this time Marius has recovered somewhat and is able to actually help run things again. A good thing too, since they’re down to twenty-six from the original fifty. And that presumably includes Valjean, who refuses to shoot anyone. Enjolras: “The last man to leave this place will blow out this spy’s brains.” Random rebel: “Here?” He suggests taking him over the lower barricade to the alleyway. It’s interesting how calm Javert is in the book. In the musical, he’s seething with contempt and frustration. Here it’s only contempt. Javert is the first person at the barricade to actually recognize Éponine, or the fact that she’s a woman, without prompting. Valjean does indeed give Javert his address (and his current alias). Javert repeats it back to him to make sure he got it right. “I find this embarrassing. I’d rather you killed me.” He doesn’t even notice switching from familiar tu to formal vous. That’s something that doesn’t really come through in translation, since English has long since dropped the formal/familiar you/thou split, so it has to be conveyed in footnotes, or in titles, or in narration. In this case, Hugo remarked on it himself to drive the point home. You know, Javert doesn’t call Valjean by his prison number even once. “24601” is such a powerful hook for identity in the musical, and with Javert I think it serves as a replacement for tu, but it’s merely an incidental detail in the novel, mentioned only twice: once in Valjean’s backstory, and once in a chapter title when he’s recaptured. Back in the stronghold, Marius has just put two and two together and recognized the inspector who gave him those two guns way back when. And as near as he can tell, Valjean has just executed him in cold blood. This will be important later. Pages covered: 1015-1041, the middle third of “War Within Four Walls.” Image by Flameng from an unidentified edition of Les Misérables, via the Pont-au-Change illustration gallery. This entry was posted in Book Commentary and tagged 24601, ABC Students, Barricade, Bossuet, Combeferre, Cosette, Death, Enjolras, Gavroche, Gavroche's Brothers, Javert, Jean Valjean, Luxembourg, Marius, Paris, Revolution, Translation on December 27, 2013 by Kelson Vibber.